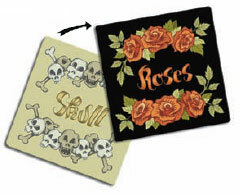 6 packs of 4 cards each with identical backs, consisting of 3 Roses cards and 1 Skull card. 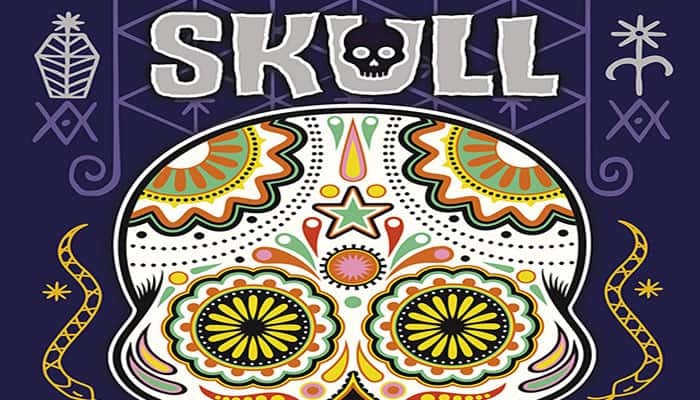 Each player takes a game mat which is placed in front of them, Skull-side up, and chooses a pack of 4 cards with the same back, which are held in that player's hand, keeping the card faces hidden from the other players. A first player is chosen. The first player verifies that the players have all placed their cards before playing. The first player can challenge someone as soon as this phase begins, instead of playing a second card. Only one card is played at a time. The cards are placed on the game mat on top of each other in a way that makes the number of cards present obvious at a glance. 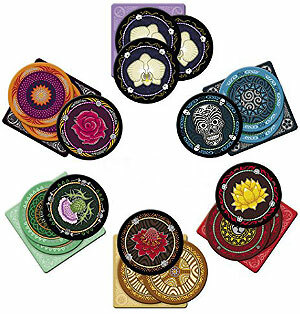 Each player secretly looks at the hidden face of the cards kept in their hand, then chooses a single one to be placed face down on their mat. Place a card or challenge someone? The first player can play a second card face-down on top of the first one played. The player to their left can do the same, and so on. 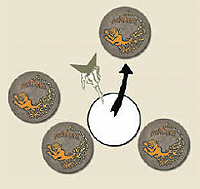 Continue in this way, clockwise, until a player either can no longer play or no longer wants to continue. When their turn comes to play a card, a player can decide not to play an extra card and can challenge someone instead. No player can place cards on their mats anymore. A player who no longer has any cards in hand MUST issue a challenge. A challenge can be issued by offering to flip over just a single card. III. Challenge - Pass or Bid More? The player who issues the challenge announces the number of cards he or she intends to flip over from among all those placed on the play mats of all the players. Either raise the stakes by increasing the previous bid. 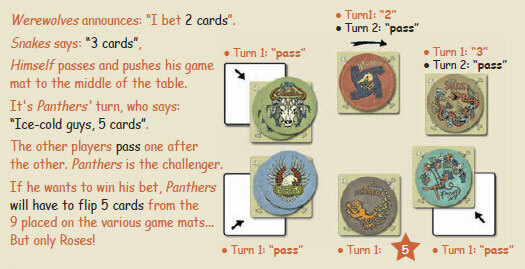 Or pass their turn and push their game mat to the middle of the table. We continue until all the players have passed except one, the highest bidder, called the "challenger". The challenger can, after having revealed his or her own cards, freely choose from which player's cards he or she will flip the remainder of his or her bet, one card at a time. The challenger starts by revealing the cards from his or her own mat. On the mats, the cards are revealed in order, starting from the top. The challenger is never forced to reveal all the cards placed on the mats of other players. The cards are revealed one at a time. The challenger must never reveal the remaining cards, as the strategy of the other players must remain secret. A player can, however, reveal his own cards himselves in order to see the possible disconcerted reaction of the challenger. If the challenger reveals a Skull, they have failed and stops flipping cards for their bet immediately. The players each take their cards back into their hands. The challenger loses one of his cards for good. 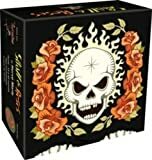 He will be the only one to know if it was a Skull or Roses. If the challenger loses his last card, he is eliminated from the game and turns in his mat. If the eliminated challenger has revealed his own Skull, he will decide who the first player for the next turn will be. 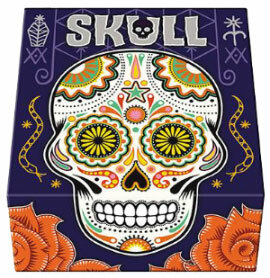 Otherwise, the first player for the next turn will be the owner of the revealed Skull. 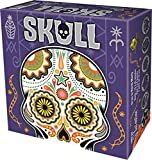 The Skull has been revealed among the cards of an opponent: the challenger shuffles his cards and places them face down. The opponent randomly selects, without touching it, one card to be discarded. That card is placed in the middle of the table and remains hidden. If the challenger has revealed his own Skull, the challenger chooses the card to be discarded himself, by looking at them, without showing anything to the other players. 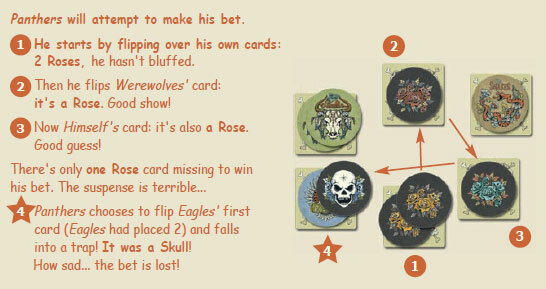 In all cases, the challenger will remain the only one to know if the discarded card is a Skull or a Rose. If the challenger flips the number of cards called and reveals only Roses, the bet is won and the challenger flips his or her game mat so that the Roses side is visible. As soon as a player wins a second bet, that player wins the game.